Reza Aslan is a historian of religions who happens also to be a Muslim. While these two identities can lead to confusion in certain members of the media (see this interview here), those matters are not the primary focus of this post. Instead, I want to use a recent interview Aslan did with CNN to illustrate the ways in which he utilizes a cultural studies approach to Religious Studies. There are three major premises of the cultural studies approach to Religious Studies, as described and detailed by Diane Moore and the AAR Guidelines for teaching about Religion in K-12 Schools. First, religions are internally diverse: there are Islams, Buddhisms, and so on – there is no one single monolithic religion that is the same in all places (to say nothing of all times). Second, religions evolve and change: they are dynamic, they respond to events in history, they are living things. Jewish thought after 1945 looks quite different than Jewish thought in 1845. Third, religions are embedded in culture: they are linked to languages, cultural practices, and attitudes (toward women, for example) that may pre-date and certainly coexist with these religions. Catholicism in New England is different from Catholicism in Latin America. 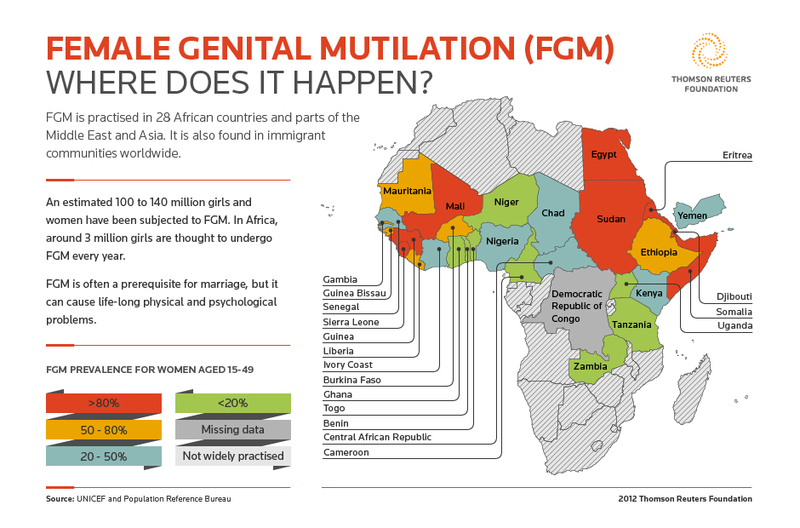 A map from UNICEF supports Aslan’s claim that this is a “Central African problem.” The countries that have this practice are located in central Africa. While some of these countries are Muslim-majority, others are not. Just as important, for this to be an actual Muslim problem, Muslim countries that are not in central Africa, such as Turkey or Indonesia or Bangladesh, would also have to have such practices. They do not. What has happened, then, is that the practices of a particular country (or region) have been collapsed into and identified with the practices of a religion. This thinking just isn’t nuanced enough. This pattern continues throughout the interview: too-general, facile claims from the interviewers followed by nuance from Aslan on topics such as women in the Muslim world. He notes that Muslim-majority countries have elected seven female heads of state, and that rights enjoyed by women in countries such as Indonesia or Turkey are far greater (and fundamentally different) from those of women in Saudi Arabia or Iran. I’ve only touched on the first half of Aslan’s interview with CNN. The second part begins with an often-asked question: Does Islam promote violence? I’ll address this topic in more detail in the next post (quick summary: no), but there are a few valuable things that I take away from Aslan’s remarks so far. First, as a teacher, I need to be aware of the broader media landscape and context in which my students live. Like the two CNN anchors, my students are bringing ideas about Islam (and other religions) into my classroom. Unless I engage explicitly and concretely with that knowledge (or, as the case may be, “knowledge”), the material I teach them likely will not have an effect on these presuppositions. Second, I need to acquaint myself more completely with the breadth of practice of the world’s religions, with attention to their internal diversity. 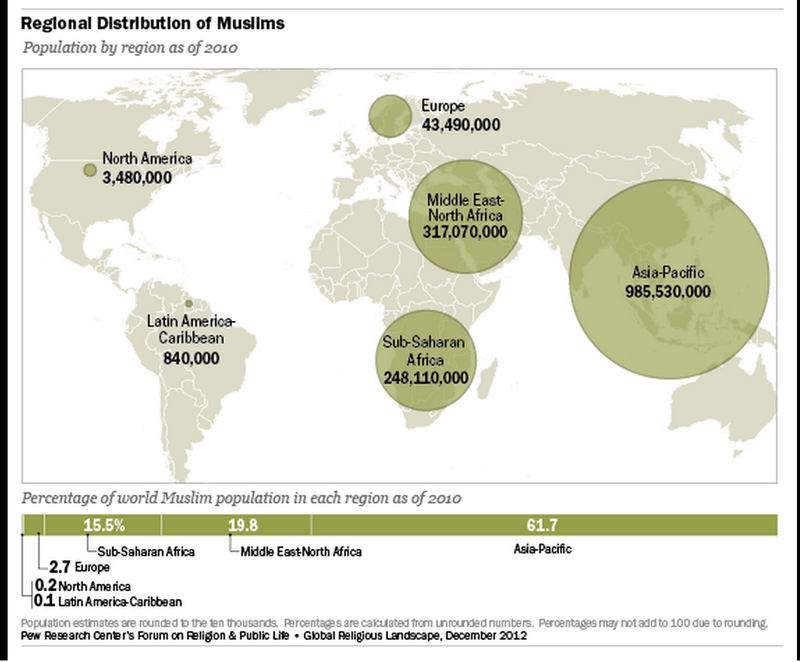 In terms of Islam, that means looking beyond the Middle East, where only 20% of the world’s Muslims live, according to this report (the source of the above graphic) from the Pew Research Center. While it can be a stretch to teach about all this diversity (especially in a limited amount of time), one way I’ve been able to incorporate it has been with structured research projects. For example, when I taught in New York City and wanted to show my students that there were Judaisms beyond those they had grown up with, I asked them to research and present on Judaism in one of four places: Uganda, India, China, Iran. Finally, there’s a reminder to me that, in the words of a mentor of mine, “You can’t be Switzerland.” The classroom isn’t a neutral place: the choices I make about what to include and exclude have consequences that are real. I need to be clear with myself about what I’m doing and why I’m doing it – and if that means pushing back against a simplistic narrative that Islam is a religion of violence (or the equally simplistic and mistaken idea that it is a religion of peace) then I need to be clear about my values for doing so and clear with the evidence I’m using. I owe that to my students, their parents, and my fellow educators. This entry was posted in Islam, Lesson Plans, Teaching and tagged Bill Maher, Christianity, female genital mutilation, Islam, Islam lesson plan, lesson plan, pedagogy, religious studies, Reza Aslan, teaching by teachingasianreligions. Bookmark the permalink.